About three months ago, my sister discovered this beautiful 1955 Dodge Jobline pick-up truck in a local Charleston newspaper. 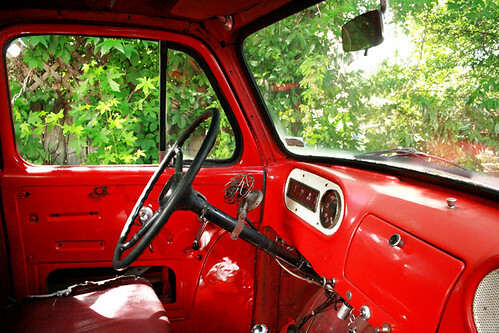 Knowing how much I’d always dreamed of owning a 1950’s red pick-up, she rang to tell me about the listing and I located it online. We talked about how beautiful it was and of all the things we’d love to do with the truck, but the price was simply too high and over time, we soon forgot about her. Then, about two weeks ago, our Granny passed away and I found myself back in S.C. for her burial. One day shortly after, with emotions still at an all-time high, my sister and I decided we would go kayaking where our Granny and Grandpa were born and raised. It would’ve been a great trip, except none of the weather forecasters had predicted the severe thunderstorms that ensued and we quickly found ourselves in need of alternative plans. What better to do than shop, right? With our trip canceled, we found ourselves riding around Mt. Pleasant with a ridiculously large two-person kayak on our roof and "nothing" to do. I mentioned thinking it would be nice to go back and check out this 1960’s “Endless Summer” type canary yellow station wagon we’d passed the day before, so we headed to the garage where it was parked. After perusing a wide array of vintage vehicles, we made out way to the garage and struck up a conversation with the mechanics. We inquired about some of the vintage vehicles and mentioned we’d found a red 1950’s red pick-up a few months back and asked if they’d ever seen one. They mentioned knowing of both a black and a white 1950’s truck, but no red one. As the conversation neared the ½ hour mark, one of the mechanics remembered he’d seen a red 1950’s pick-up parked at a law firm not far from the shop. As soon as he said this I thought (and my sister claims I said out loud), “That’s it!”. After getting a few other places / people’s names who might know where to find a 1950’s pick-up, we took our chances and headed to see the truck the mechanic had mentioned seeing "a while back". We had nothing to lose by looking. As soon as we saw the vehicle and drove around the back-end, I knew it was the same one my sister had found three months prior. On the driver’s door window hung a sign advertising a slashed price and a phone number. After taking some photos and checking out the vehicle, my sister rang the listed number. We’d both just assumed the truck belonged to a man, so when a woman answered, she was surprised. After speaking for a few minutes, it became clear the voice at the other end was not going to “hand the phone over” (to a man). So, my sister asked, "Are you the owner? ", to which the woman replied, "Yes!". Needless to say, I think we were all a little surprised. The owner – Christine – explained she’d moved to Charleston from NYC to get into the bakery business and had bought the truck to "pick up men" – yes, that’s why she’d gotten it. At this juncture, my sister looked like she’d seen a ghost. There were several reasons for this "ook". One being, she’d been born in NY and two, her sister (that’d be me) currently lives there. Thirdly, she’d been trying to figure out how to transition out of a career in radio and was thinking of starting a baking business! I’m not kidding. When she asked Christine if owning the truck had indeed helped her meet any men, she said it hadn’t, but that the truck had been rented quite a few times for photo shoots and commercials. Gears in our heads quickly began turning. And Christine was so happy that women were calling about the truck because she specifically wanted to sell the truck to a female. She told us to go into the offices and get the keys to go for a spin. She’d also mentioned the mechanic who’d worked on the truck was close by and told us where to find his garage. After going in and speaking with a lovely woman who had some problem locating the keys, we went back outside to wait. After a few minutes, the keys arrived and the girl mentioned if we could wait, that the mechanic who’d worked on the vehicle would be coming by to pick both she and her Mum in a few minutes. Huh? Why?!? Because the mechanic was her father! When we heard this, it was like a bolt of lightening had struck. How was it possible the mechanic we’d just been told about and whom we were going to go visit would be coming to us? Things were just getting too weird, so, of course, we waited. It seemed kizmit was taking over at this juncture. It had been a while since I’d driven a standard, though it’s been my main transmission for the majority of my driving years, so I wasn’t too worried. And, my sister had learned how to drive a standard shift on a tractor on someone’s farm, so between the two of us, we thought we’d be okay. Not long after, the mechanic arrived. If seemed the truck hadn’t been started in a while, so he had to jump-start her and we all piled in. He took us to a nearby car park and we drove around back to an empty area. My sister decided to go first and we all had a really good laugh. Next, it was my turn and after the mechanic properly explained the H-gear pattern, I did an so-so job with the ½ ton, no power steering, no power breaks slant V6 badass – though this isn’t to say it wasn’t nerve-racking as hell! Not only was she extremely difficult to maneuver, but somehow driving her made one’s hands completely black and at some point, we’d all touched our faces and had black marks all over ourselves and our clothing. We looked like Al Jolsen in his black-face – except, in reverse! After returning to the law firm, we said we’d be back in a few days. We spent a day trying to figure out how we could make getting this truck happen and returned to take (what we’d already named) “Big Red” to a few mechanics shops and restoration experts the following day. Before getting out on crowded main roads, we decided to get some more practice driving the truck and so, after some quick cleaning of the windows and interior, we headed back to that nearby car park. It’s a good thing my sister had learned to drive on a tractor, because on this particular 97degree afternoon, “Big Red” was akin to driving around in a 1/2 ton tractor. Driving Red was roughly the equivalent to taking part in a triathlon in 105 degree temperatures. Because she’s so hard to drive, on one occasion, I had to grab the giant wheel and help my sister make a turn! Yes, it took two of us and we’re both over 5”10, with plenty of muscle. Oh how I was beginning to appreciate power steering! Jerking in-and-out-of all three gears, my sister finally stalled Big Red for a second time – sending us to a halting stop. Sweating and dirty, she screamed out in frustration, “Oh my God, I can’t do this! We’re crazy! This is never going to work!”. Searching for the inspirational words an older sibling is supposed to have at the ready, I turned my head and spotted this white big rig parked just beside us and nearly fainted. For, it was a Cardinal line truck with no more than two cardinal emblems – one on the cab and one on the trailer – emblazoned upon it. You see, our Grandfather, who had died when we were very small was a country boy (related to Swamp Fox – yeah!) and his favorite bird was the cardinal. We know anytime one crosses our paths, to pay close attention. Gasping, I directed her attention right toward the “cardinal spotting” and we both nearly lost it. Tears welled up in both our eyes. My sister then took a deep breath and said, “Did you see the pair of cardinals fly past us as we drove back here?”. I hadn’t and said so, but quickly grabbed my camera to capture the rig carrying the cardinal message from our Gran. While neither said so, in that moment, I think we both knew we’d buy the 1955 Dodge- even before we took her to get checked out. Can’t go against the elders, right? We offered nearly half the original price and Christine accepted. So, if for any reason, you’re in need of a classic 1955 Dodge pick up truck in fire engine red, you know who to contact! Let me get one thing straight with you. I’m not some mainstream softy dating author that writes politically correct vague advice that sounds good. No, in fact I have I met, worked with and gone out “picking up” with the best underground gurus in the world. I have spent over a decade trying out every method in the world, being proficient in it and even teaching it with the best. Yes, even those guys you see on TV with reality show. I have however come back from the mountain to deliver a shocking secret to you. You see… Nothing actually works when it comes to picking up women. By this, I mean, everything works exactly the same. To cut the story short, I’ll just head to facts immediatelly. Even the best of the best gurus in the world, only get 2% of the women they try to pick up. No, this is not a typo. Now, most of these guys focus on completely random women and cold pick ups of women they’ve never met before that day. Percentages are much better in say social circles or where the woman invited your approach. In those situations even a dweeb might succeed 50% of the time. Here is the point though… There is no magical secret that allows you to make women want you. There is no method or technique to picking up women. Its always going to be a numbers game. You will not get every woman you attempt to. The reason I am telling you this is to cut you the many years in chasing for the magical results that you can’t even accomplish. What I will offer here is the simplest, easiest way to picking up women in a realistic manner that works efficiently, simply and effortlessly. 2) Focus on being the guy (or group of guys) that stands out the most. If you’re in a club, you want to be the most fun guys that are having the most fun in that club. This increases the amount of women who notice you, and want to be picked up by you. Me personally I’ve gotten to the point where in a club, at least a dozen hot women either stare me down, or come dance off of me. Grinding and rubbing off of me. 3) Maximize your attractivness using the 90/10 rule. What most guys do is pick one feature of being attractive and get obsessed with it. For example they become bodybuilders and pretty much make it their second dayjob. Here’s the trick, you actually can get 90% of the results in any sphere with just 10% of the effort. If you’re working on your physique, sure, looking like a fitness cover model helps, but you get 90% of the same results by just simply being more fit than average. Just make sure your shoulders are wider than your belly, and your biceps wider than your forearms. Its much better to have an “ok fit body”, “better than average finances”, “be an ok dancer” and “an ok photographer”, than just have an ideal body or be rich (but have no other traits developed). Again, just take up a bunch of traits, and only develop them to ok levels, and you will get 90% of the result that you would by getting to master levels. You don’t have to join a dance class and become the best dancer in town and know as much as the instructor. Just knowing some basic dance moves, gets you 90% of the results that you would if you were an extraordinary dancer, because most guys don’t know anything! So its better to go to the gym, go to dance classes, take up yoga… And get good at all of these, then get obsessed with just one and be one dimensional. 4) Once you have become more attractve, then next focus on being social. I know it sounds counterintutive, but the best way to fail at picking up women is to try and pick up women. Just focus on going out, being social, meeting tons of different women and then seizing opportunities when they arise. Its much simpler, easier and effortles than the PUA method of “sarging” 100 women to pick up 2 of them. In this approach, you talk to everyone, and when women show interest, you make use of it. You actually get the same result, but with much less effort. Now… I hope I didn’t confuse you with all this information on picking up women. If you want more clarification, maybe you should get more personalized and fill out my quiz. This will tell you what you personally need to do to be picking up more women.